MOHEGAN INDIAN RES. - Bria Hartley is living the good life. 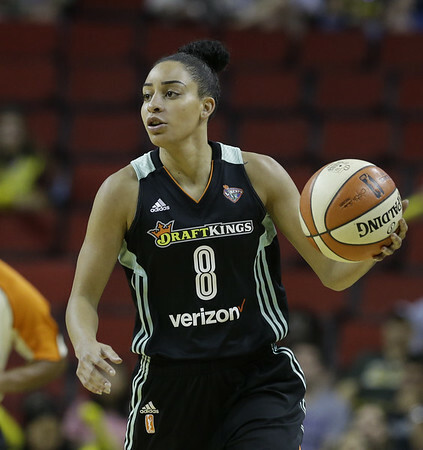 The two-time All-American and national champion with the UConn women’s basketball team is in her fifth season in the WNBA and second with her hometown New York Liberty, who visit the Connecticut Sun at Mohegan Sun Arena on Wednesday night. She has an 18-month-old son, Bryson. “I worked on it while I was overseas (in Turkey) and this is the first summer that we’ve competed,” Hartley said. “We have one team right now with eight players so we can grow that. Hartley, who will turn 26 on September 30, grew up in North Babylon, New York, and was a consensus high school All-American in 2010. But she didn't explode onto the recruiting scene until she started playing for coach Apache Paschall and the Exodus AAU program out of New York City. The 5-foot-8 guard became the second player in UConn history to finish her career with 1,500 points, 500 rebounds, and 500 assists, joining Maya Moore. She was a WBCA All-American in 2012 and 2014 and her uniform No. 14 is part of the Huskies of Honor program and was part UConn’s 2013 and 2014 national championship teams. She was a first-round pick by the Seattle Storm in the 2014 WNBA Draft but was traded to the Washington Mystics about an hour after being selected. She was traded to the Liberty in 2017, at about the time she gave birth to her son. Her dream is to expand the focus of Bria Hartley Elite. “I’d like to be able to start a foundation, a non-profit, to raise money for things like autism, cancer ... I know a lot of people have those things but I want to do my part,” Hartley said. “It’s a step-by-step process. When I’m overseas I’m able to getting things like that done. For now, Hartley is balancing basketball and motherhood. In 25 games with 20 starts, she is averaging 8.7 points, 2.9 rebounds, and 3.7 assists with an assist-to-turnover ratio of just under 2-to-1. New York will take a four-game losing streak into Mohegan Sun Arena. The Liberty and Sun have traded buzzer-beating road wins. Connecticut topped New York 88-86 June 7 on Shekinna Stricklen’s game-ending four-point play. New York returned the favor here July 11 as Shavonte Zellous beat the buzzer on a 3-point shot for a 79-76 victory. The Liberty (7-18) have nine games remaining and are on hanging on in the playoff race by a thread. They trail the eighth-place Sun (14-12) by 6½ games for the final berth. If Washington and Dallas win their games tonight and Connecticut beats New York Wednesday night, the Liberty would be mathematically eliminated. But no matter what happens, Hartley gets to go home to her biggest fan - her son. Bryson’s father is former UConn football player Shakim Phillips, so sports figure to be in young Bryson’s future. “He can move. He gets around all over the place,” Hartley said with a laugh. Posted in New Britain Herald, UConn on Tuesday, 31 July 2018 15:01. Updated: Tuesday, 31 July 2018 15:04.